This trip gives you an opportunity to explore the most famous cities of Rajasthan and simultaneously discover the real Rajasthan through visit of rural villages and off-beaten destinations on spirited journeys set to open your eyes, heart and soul. 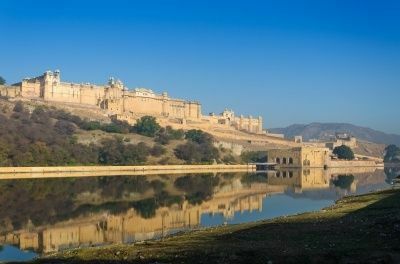 Meet every day extraordinary people, immerse yourself in ancient, thriving cultures and marvel at Rajasthan’s characters. We provide opportunities for travelers to engage with local communities; see, hear and learn through interactions, stories and experiences that make this trip so unique. The tour starts in the Indian capital of Delhi, where you will have the opportunity to discover the old enchanting streets of the inner city of Paharganj thanks to the help of young guides trained by a local NGO working in favour of street children. On the way to Rajasthan you will visit the famous building of Taj Mahal, an UNESCO world heritage site, which was originally built by Mughal Emperor Shahjahan, in the loving memory of his wife. 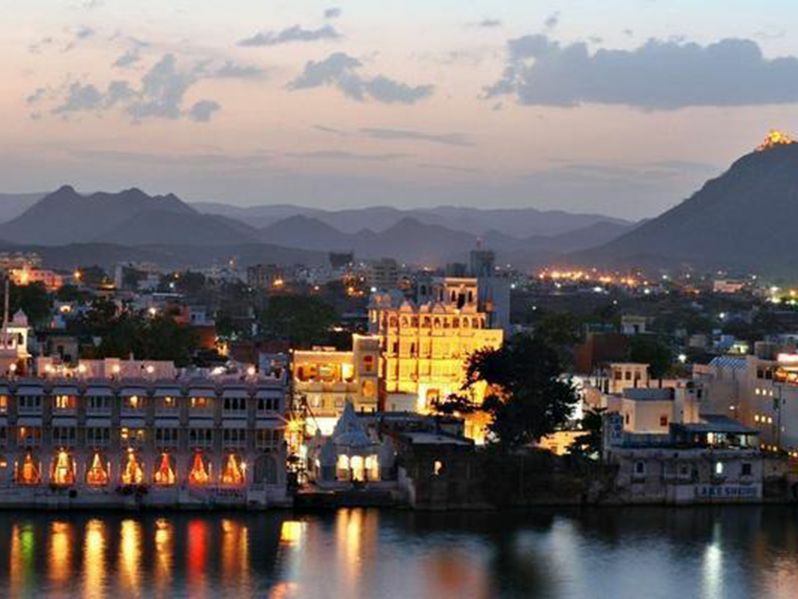 The tour will bring you to discover some of the most beautiful Rajasthani cities such as the pink city of Jaipur, the holy city of Pushkar, the blue city of Jodhpur and finally the lake city of Udaipur. While visiting those famous cities you will have the chance to explore rural villages and meet local people, discovering the diversity of cultural expression through folk dance, folk song and puppet show performances. You will attend puppetry and pottery workshop as to learn and create your own puppets and pots that you can carry home as souvenirs. This will give you the opportunity to discover the source of a community’s culture and celebrate the ancient, living traditions that miraculously continue to thrive. At the same time you will have the chance to experience directly the life of traditional Rajput (royal caste) families, spending some of your days and nights in royal palaces and castles with royal families in Roopangarh and Bhenswara; Roopangarh Fort is a former fortress and palace in the town of Roopangarh, which today has been transformed into an heritage hotel, where travelers can experience the essence of Maharaj culture. In Bhenswara instead you will be host in the Ravla castle, an ancestral heritage which reflects the traditional Rajput hospitality with a wonderful blend of tradition and modernity. The ambience at Ravla Bhenswara means sheer luxury amidst a traditional village. When you are hungry, indulge in well-known succulent Rajasthani food and learn secret recipes. On special request, we can arrange for culinary workshops where you can engage with host, source vegetables from the market, give a hand in preparing the delicious Rajasthani dishes and sit out and have a satiating lunch/dinner with the family. During free time, stroll around the village; spend time with farmers and women who engage in different kind of activities. Drive to Pushkar (160kms, approx. 3,5 hrs. drive). En-route stop at Bagru, known for its block printed textiles. This is a good opportunity to see craftsmen/women at work. Proceed onwards to Tilonia, a small village in Rajasthan, the home of the NGO called Barefoot College. Rajasthan is truly a state of contradictions. From Havelis to rich home-stays to Heritage Palaces to Luxury Hotels, Rajasthan is also one of the poorest states in the country. If any one wonders about how such contradictions can exist in a place, the visit to Tilonia is important for us to explain the story of the ‘bare-foot-soldiers’ who are making massive social and environmental changes using local knowledge and resources. From mask making to workshops on puppetry and interaction with local people, the visit gives ample opportunity to understand the dynamics of the state that is Rajasthan that is far away from the tourism circuits. Subjects like water management, solar energy are touched during the visit. Visit the library and watch documentary film on the achievements of this social college. Lunch in the campus. Thereafter visit the Harmara village where you will meet the leather maker, spend some time in his house and watch the process of making bags and belts. You may purchase directly should you wish to. 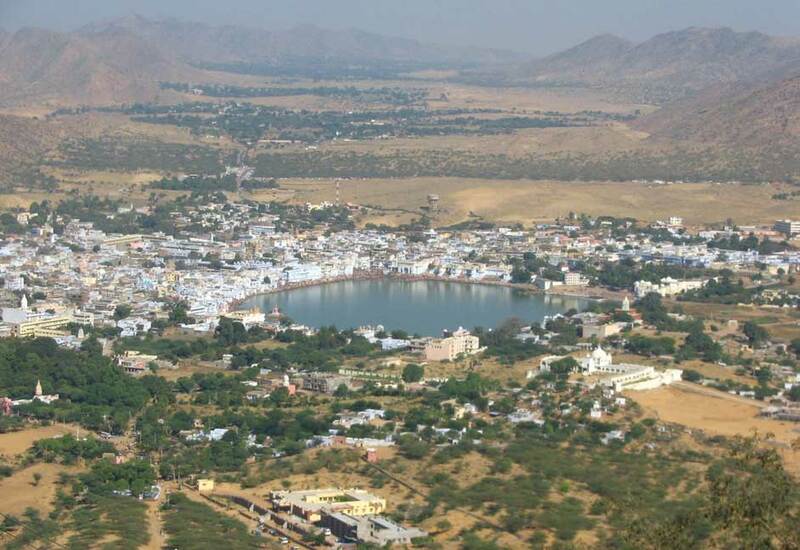 Proceed to the holy town of Pushkar. 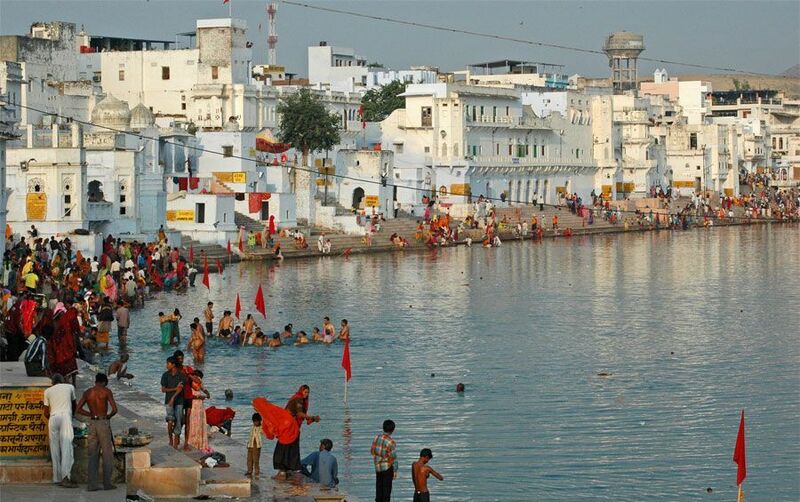 Pushkar is one of the most revered Hindu pilgrim center famous for the cattle fair and Lord Brahmas temple. 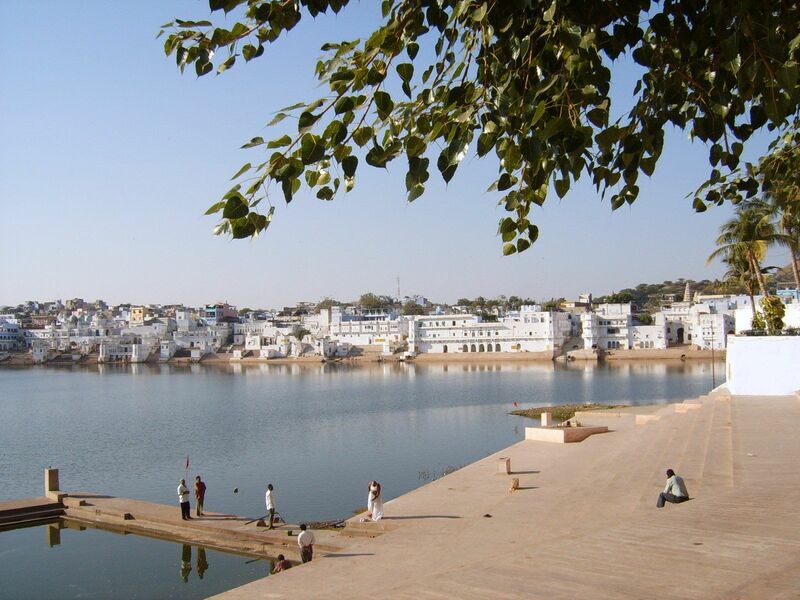 The word ‘Pushkar’ means lotus flower, which is said to be the seat of Brahma, one of the Hindu holy trinity, who is worshipped as the creator of this world. Watch the evening rituals near the lake. 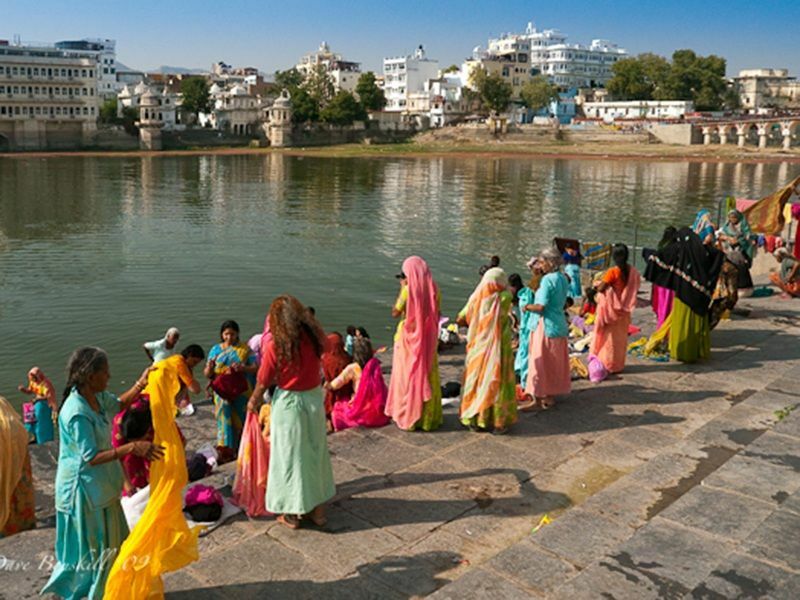 In the morning go for a walk inside the lanes of Pushkar; you may meet citizens from the most part of world in quest of finding the inner self. Hinduism is a thought process and this you can see it in Pushkar. Enjoy a meal overlooking the lake. Spend time visiting the Brahma temple, Jagatpita Brahma Mandir, and if you are lucky meet a Yogi meditating near the lake. The temple is one of very few existing temples dedicated to the Hindu creator-god Brahma in India and remains the most prominent among them. Although the present temple structure dates to the 14th century, the temple is believed to be 2000 years old. The temple is mainly built of marble and stone stabs. It has a distinct red pinnacle (shikhara) and a hamsa bird motif. The temple sanctum sanctorum holds the central images of Brahma and his second consort Gayatri. After breakfast leave for Roopengarh (approx. 1 hr. drive), a desolate Fort where once a Mughal King had spent a night. 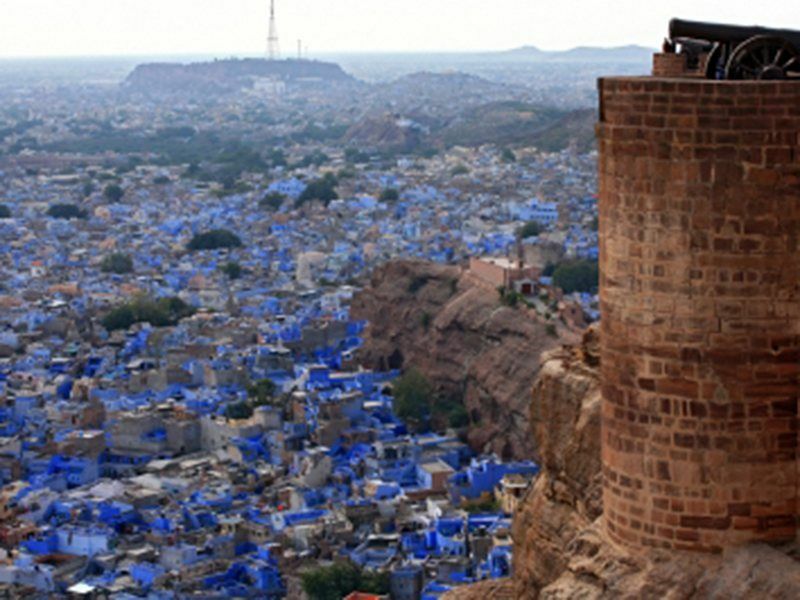 Roopangarh Fort is one of the favorite place for those who have some sense of history and want to enjoy Rajasthani culture and history both at the same time. Now converted to a heritage hotel, Maharaja Roop Singh constructed it in 1648 A.D. In the afternoon visit Roopengarh village where you will meet various artisans ,weavers, Gota maker, Durry maker, Potter. Understand how Rural India connects to commerce through handicrafts. Handicraft is the biggest occupation in India after agriculture. After breakfast leave for Guda village near Makrana. Gandhi once had said that “Real India lives in Villages”. This is what our intention is… The 2 day stay will give you deep understanding on various issues which is faced by the real India.. women empowerment, social conditions, Health, Education ,livelihood issues … The day spent in the Gudda Village takes you to the “basti’s of these artists to do workshops on puppetry. The focus of workshops will be to explore how puppetry can be used in the modern days to convey the message of literacy, health, hygiene and primary education. The guests gets to make these puppet and learn from the masters who are traditional artists. Evening with the Bhopa community: the feudal stories of Papuji Rathore is sung by the members of Bhopa community in the evenings post sunset. As typical of our tours, the performances are not organised in hotels or resorts, instead we invite our travelers to our villages to meet and interact with the communities and understand more about their social backgrounds and enjoy the ritualistic traditions. You will also get opportunity to visit a local school and interact with children. In the evening house ladies will put Mehendi !! Return back to hotel. Drive to Mandore near Jodhpur (270kms, approx. 5,5 hrs. drive). Arrive in Mandore and proceed to Mandore Guest House. Mandore guest house provides great opportunity to work with volunteers of the NGO supported by the family. If you could let us know about any particular skills you would want to make use of during your travel, we can connect you with the local partner who will match the skills, provided there is a need for such voluntary engagement. The volunteers are actively involved with and support projects that are secular and have an education-related component to them apart from health care, environment, socio-economic aspects and women’s issues i.e. Women in Difficult Circumstances. It also includes activities directed toward meeting the needs of the poor and needy – distribution of food, clothing or medicine; provision of housing for handicapped animals etc. 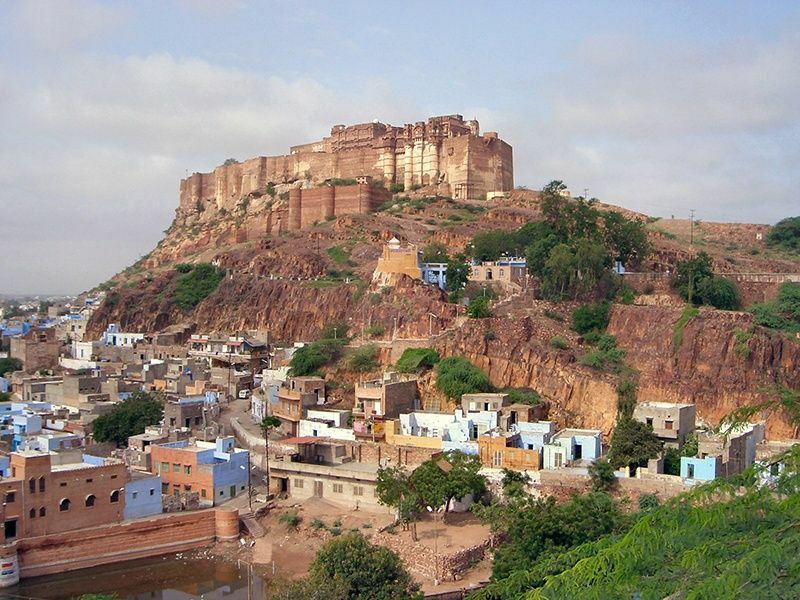 In the morning visit the magnificent Mehrangarh Fort and the bazaar. Various activities are possible at Mandore ranging from Bird watching and cycling to nearby village to see the rural projects. Jeep Safari to Bishnoi village is also offered by the hosts at Mandore Guest House (on direct payment). Drive to Bhenswara (120km approx. 2,5 hrs. drive). The RAVLA castle or manor was built by Th. Jagat Singh Ji Rathore (Champawat) founder of Bhenswara about 240 years old. Built in a typical Marwari Rajput Architectural style. This Ravla has been refurbished in the early 1940’s by Late Th. Madho Singh Ji he added modern comforts to his Ancestral Home, which has enabled Thakur Dalvir Singh and his family to converted Ravla Bhenswara into Ancestral Heritage 18 years ago, which has been occupied by the Champawat ruling family for ten generations. The Ancestral heritage reflects the traditional Rajput hospitality , which is a wonderful blend of tradition and modernity. The ambience at Ravla Bhenswara means sheer luxury amidst a traditional village. Forty tastefully decorated rooms and suites with a historical Indigenous theme, which are now personally run by Thakur Dalvir Singh, Thakurani Shobha Kanwar, Kanwar Shiv Pratap Singh and his wife Kanwarani Uma Kumari and tenth generation of the founder Pragati Kumari and Shivdutt Singh play an active role in the running of their Ancestral home. The Aravallis welcome your entry into Udaipur via Ranakpurtemples (180km , approx. 5hrs drive) and enjoy the changing landscapes on the way. Stroll along the lakes and the narrow lanes, each with a unique character. 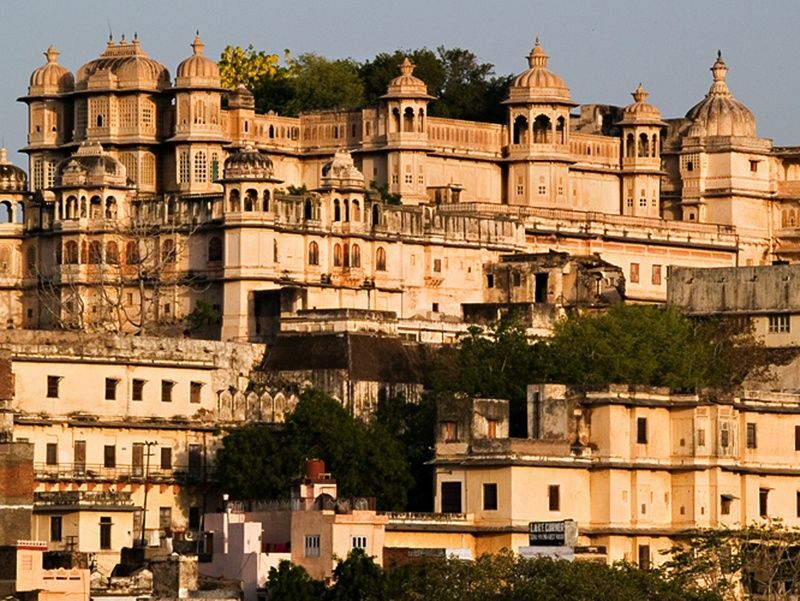 Udaipur apart from its history, culture, and scenic locations, it is also known for its Rajput-era palaces. The Lake Palace, for instance, covers an entire island in the Pichola Lake. Many of the palaces have been converted into luxury hotels. It is often called the “Venice of the East”, and is also nicknamed the “Lake City”. Lake Pichola, Fateh Sagar Lake, Udai Sagar and Swaroop Sagar in this city are considered some of the most beautiful lakes in the state. 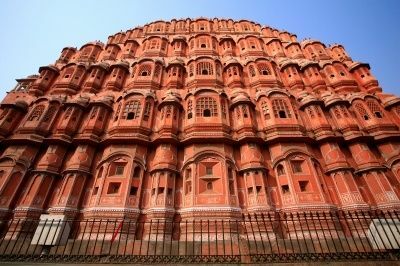 Jaipur, the Pink City, is undoubtedly the must visit destination in Rajasthan. 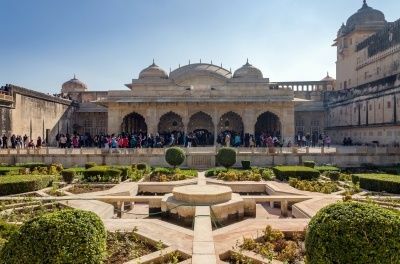 The ancient forts and palaces and unique architectural splendors not only win the heart of the visitors but also ensures a memorable vacation. Jaipur is also an important part of the popular Golden Triangle Tourist Circuit of India. The remnants of a bygone era charm the visitors and provide them the glimpses of the regal lifestyle enjoyed by the reigning monarchies. Rajasthan is truly a state with contradictions. From Havelis to rich home-stays to heritage palaces to luxury hotels, Rajasthan is also one of the poorest states in the country. If you wonder about how such contradictions can exist in a place, the visit to the Barefoot college in Tilonia will give you several answers thanks to the story of the ‘bare-foot-soldiers’, who are making massive social and environmental changes using local knowledge and resources. However, all the itinerary has been designed in order to promote direct or indirect benefits for local communities, environmental conservation and protection of cultural heritages. When possible we have selected traditional accommodations sensible to social and environmental issues, following general principles and practices of responsible tourism. One of the main principle on which we have selected the infrastructures where you will be host during this tour is based on the protection and safeguard of local traditional architecture. In this way we intend to use the cash flow coming from the tourism to value the protection of historical and traditional buildings, using some of these renovated building as hotels during your trip. Thanks to the economic impact of tourism it has been possible to renovate and preserve some important traditional palaces, forts and buildings of Rajasthan, which otherwise would have been destroyed or abandoned. This trip covers some popular destinations, but we have tried to include places like Roopengarh, Mandore and Bhenswara, which gets lesser tourist traffic in Rajasthan. By including less popular destinations, we hope to equalise the tourist cash flow to some extent. Moreover, the selection of traditional heritage palaces will allow us to promote a real immersion into the traditional culture of Rajasthan, trying to foster a real cultural encounter with local communities. However, beyond the dominant culture of Rajputs, the royal caste, we rely also on the work of local NGOs or voluntary organizations as to learn about their activities, having the opportunity to discover reality and glimpses of social and cultural alternatives. 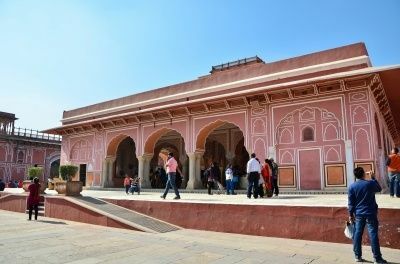 You will have the opportunity to visit the chaotic Delhi with different eyes, visiting the most remote and unusual parts of the old city with the help of marginalized young people trained as tour guides by the NGO Salaam Baalak. Through the helps of these young guides you will have the chance to learn about their life experience as street children. This NGO has been working for several years in the slums and poor neighborhoods of the capital, creating several accommodations for street children and promoting their education and access to work. During the two-hour guided tour in the areas of Paraghanj, you will have the opportunity to visit these shelter homes and understand the projects undertaken by this NGO. All the itinerary is created in collaboration with the Kalakar Vikas Samiti, a small group of traditional artists who make a living out of art and handicrafts. Most of the hotels and restaurants showcase Rajasthani artists and except for a visual contact, there is real no connection with the artist. Our itinerary will give you an opportunity to understand where they come from, their art and culture. You can visit them in their houses and villages during the trip. This ensures that they don’t compromise on their dignity and perform just for the sake of making a living. Our involvement with the community ensures their capacity building, training on social skills and building networks of artists in different parts of the Rajasthan so that the benefits of Responsible Tourism is spread across the state and not restricted to certain tourist places. We organise workshops that provides an opportunity to not only learn their craft but also understand their social environment. One of the off shoots of these workshops is responsible shopping where travellers can purchase products directly without paying middle men who make unreasonable profits at the expense of the real artists. We promote responsible shopping in Rajasthan – buying local handicrafts directly from the artists, thereby ensuring that the artist gets his worth. We promote home stays so that the benefits go directly to local people. In Tilonia you will visit some of the activities of the NGO Barefoot College, which has as its main objective to promote innovative sustainable solutions to promote the self-sufficiency of marginalized rural communities. We selected beautiful and traditional heritages resorts with excellent facilities throughout the tour. 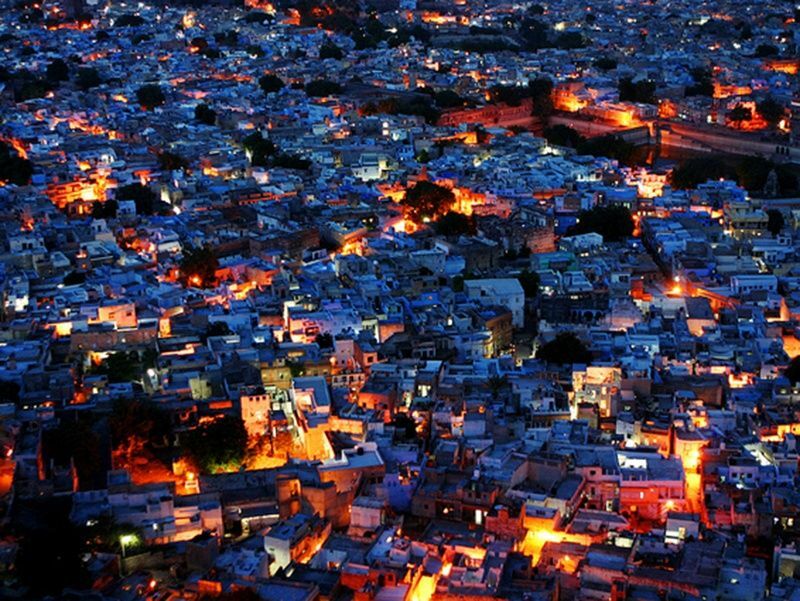 Whilst in Jodhpur we have selected a guesthouse in a village nearby called Mandore, where you can experience the work of a local NGO called Mewar. In Roopengarh and Bhenswara, accommodations are traditional Royal palaces/castles, where you can experience Rajput lifestyle. However, the hotels have been selected carefully according to criteria of social and environmental impacts. “wonderful places full of atmosphere…All the hotel have been chosen perfectly and also the simple staying inside these marvellous hotels has been an experience itself!!”. “the journey has been a great experience!!! The visit of small towns, villages and development projects provided me with a rare opportunity to know the local culture and traditions… I would like to thank also our great guide Shiva, who has been very important for the success of the trip! He has been very professional, kind and helpful with all the passengers. Thanks a lot for this wonderful journey!!! Namaste!